Exploring Mars has had its share of victories and defeats. The twin rovers, Spirit and Opportunity, have proven to be the greatest success story in the exploration of the Red Planet, both exceeding their lifetime warranties nearly thirteen times over and making great discoveries. Unfortunately, Mars has had a nasty reputation of gobbling up spacecraft at a hungry rate before having a chance to return any data. One of the most painful blows for the U.S. was the crash of the Mars Polar Lander near the Martian South pole on December 3, 1999. All hope of exploring the water ice rich polar region was lost and the next lander scheduled to fly in 2001 was mothballed, even though it was nearly fully built. The painful lessons and understanding of what went wrong with the Mars Polar Lander enabled scientists to resurrect a new polar mission using the mothballed lander. In a few months, a new polar lander called Phoenix, like its mythological namesake, will rise from the red dust to write a whole new chapter in the exploration of Mars. Mars is a cold desert planet where temperatures can plunge as low as -190ºF during polar winter nights and seldom tops 50ºF during summer daytime at the equator. The thin carbon dioxide atmosphere is 100 times thinner than Earth’s. Under these conditions no liquid water can exist on the surface. The Mars Odyssey and Mars Express Orbiters have discovered large amounts of subsurface water ice in the vast northern plains in the Martian arctic. Phoenix will land in this region and use a robotic arm to dig deep beneath the soil and into the water ice layer. It will scoop up the soil and analyze it with sophisticated equipment aboard the lander. Phoenix is a stationary lander and cannot rove so the selection of the landing site is critical. Using the high-resolution cameras of the Mars Global Surveyor and Mars Reconnaissance Orbiter, Phoenix will land in the high arctic plains, around 65º-72º North, where there is evidence that an arctic sea existed around 100 million years ago. Both polar ice caps are composed of water ice and carbon dioxide ice. Phoenix has two mission objectives: (1) study the history of water on Mars by analyzing the water ice below the surface and (2) determine if the soil could support life. After digging into the soil and water ice layer below, it will analyze their chemical and water content, which should give a better idea of the history of the Martian arctic. Phoenix will have chemical equipment on board that will test the soil’s composition for habitability. It will check for life supporting elements: carbon, nitrogen, phosphorus, and hydrogen. Recent discoveries have shown that bacterial spores can survive very extreme conditions such as the bitter cold, dry, and nearly airless conditions found on Mars by remaining dormant for millions of years. Mars’ wobble on its axis is far more extreme than Earth’s. This can have a profound effect on its climate, possibly allowing liquid water to exist on its surface approximately every 100,000 years as the atmosphere warms and thickens, which could provide favorable conditions for the bacterial spores to grow. The recent Mars missions have been “following the water” because life as we know it requires water and if scientists hope to find life on Mars, past or present, exploration must be where there is evidence of sufficient water, even if it is frozen. Water must be liquid to allow chemicals to flow into and out of cells. Water vapor and water ice are not as effective. Liquid water is also vital for chemical reactions. It can dissolve sugar and salts, but cannot readily dissolve oils and fats, which are components of cell membranes. Water can also hold heat efficiently, which prevents wild swings in temperature that would disrupt life. An excellent example in our region is the ability to grow grapes and produce wine around the Finger Lakes due to their protective warmth. The lakes stabilize the climate with their warmth and produce a longer growing season by delaying the killing frosts. Water also has a strange property where it floats as it freezes. The surface forms a sheet of ice that insulates the water below making it habitable for life. Phoenix has four mission goals. (1) Determine whether life ever arose on Mars. Phoenix will analyze the soil it collects to determine if microbes could grow and reproduce during warmer periods when the soil is moist. Since the surface is exposed to the harsh ultra-violet rays from the Sun, the best chance to find any evidence of life will be beneath the surface in the water ice region. (2) Characterize the climate of Mars. Phoenix is a fully automated weather station. It will land when the North polar ice cap is retreating and the frigid soil is being exposed to the sunlight after a long winter. It will be able to study the interaction of the atmosphere with the surface of the ground as it warms and summer arrives. It will continuously measure wind speed, direction, temperature, and barometric pressure. (3) Characterize the geology of Mars. Water changes the soil in many ways and the landing site for Phoenix may have once been a deep ocean capable of leaving sediments. Layers of mud and silt would support evidence of an ancient ocean. Coarse sediments of sand would indicate flowing water, especially if the grains are rounded and well sorted. Phoenix has a microscope that will be able to examine these grains. (4) Prepare for human exploration. Water will be a critical resource for future human explorers and Phoenix will be able to determine its abundance and availability along with determining the chemistry of the soil and its potential toxicity. Phoenix will carry several science experiments, which include a Robotic Arm that will do the digging and scooping of the soil and water ice samples and deliver them to the other experiments on board. There will be a Robotic Arm Camera that will give full-color, close-up views of the surface, prospective soil and water ice samples, collected samples in the scoop, and the texture and layering of the trenches. The Surface Stereoscopic Imager is the main pair of “eyes” for the mission that will provide panoramic full-color images of the landing site, provide range maps to support digging operations, and make atmospheric dust and cloud measurements. The Thermal and Evolved Gas Analyzer is a mass spectrometer, which will analyze the gas boiled out of the collected samples by heating them in eight tiny ovens. The Microscopy, Electrochemistry, and Conductivity Analyzer are a combination of several scientific instruments that includes a wet chemistry laboratory, optical and atomic force microscopes, and a thermal and electrical conductivity probe. By mixing small amount of soil in water, important chemical properties such as acidity, saltiness, and composition can be determined. A microscope will also examine the soil grains to determine their origin and mineralogy. The Mars Descent Imager will acquire a series of wide-angle color images of the landing site while Phoenix is descending. The landing will not use airbags, but instead will be the conventional rocket-assisted landing similar to the Viking Landers and the ill-fated Mars Polar Lander. Observations made by orbiting spacecraft and the rovers reveal geological features that are believed to be proof that water once flowed or ponded on Mars. Channels connect high and low areas, gullies erode the rims of several ridges and crater walls, and minerals such as hematite, which is formed by water, are also found on Mars. 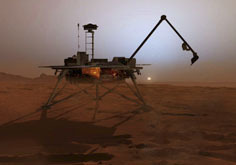 The launch window for Phoenix will open in a few months from August 3-28 and after a flight of about nine months it will land on Mars on May 18, 2008. It is expected to continue to operate at least through September 2008 and possibly longer until it succumbs most likely in 2009. By then the return of long winter nights and intensifying cold as low as -190ºF will cause the advancing North polar ice cap to bury it under several feet of dry ice. In its wake, a new chapter in the era of exploring Mars will have been written in spite of the lost Mars Polar Lander nearly a decade ago. It is hoped that Phoenix, like the mythical bird it represents, will rise up from the failure of the Mars Polar Lander by further increasing the understanding of the evolution and role of liquid water on and beneath the dusty red deserts of Mars.